Louise: Hi there, this is Louise from Executive Connexions. My role is engaging with recruiters in order to introduce our clients to them. I am joined today by my colleague Daniel. Daniel is responsible for connecting with our senior executive clients and helping them to better understand our career coaching services. This podcast is entitled: Is your age holding you back in your job search and what can be done? So let’s dive right into this: Daniel, do candidates feel that ageism is a real issue in the executive job search and is it something that is prohibiting them from landing their ideal job? Daniel: Yes, Our recent independent research shows that candidates feel that ageism is very much a real issue in the executive job search. However, recruiters don’t see age as a significant barrier to employment. Actually, Executive Headhunters and recruiters are finding that increasingly, hiring managers want to employ senior executives with a track record of success that spans decades. Louise: In what way do candidates feel that ageism is very real and alive, in job hunting? Daniel: Interestingly the research has shown that an alarming number of candidates cited ‘being over-qualified,’ ‘over-experienced’ or ‘age discrimination’ as significant obstacles in their job search. Daniel: The underlying issue? This is what is known as unconscious bias. We all hold beliefs about the abilities of individuals in relation to their age (or some other characteristic) that we’re often unaware of. We make quick assessments of people without realising. Don’t second guess the employer –we’re not as good at mind reading as we like to think! 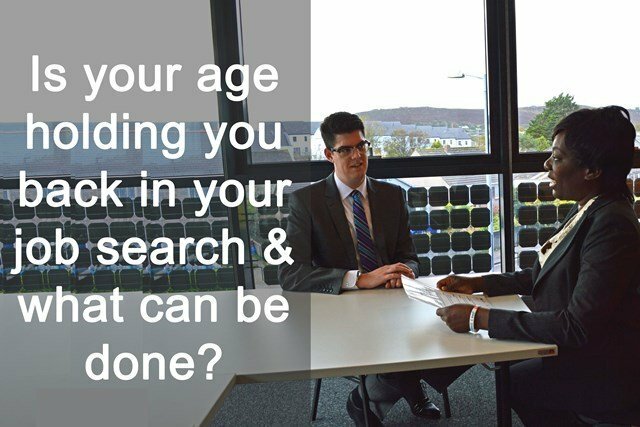 It’s risky to assume your age is holding you back; you’re a strong candidate and any obstacles are more likely to be a job search skill you can improve upon. Louise: What stumbling blocks do you feel some of our candidates might think that a potential hiring manager may have about them regarding their age? Daniel: Some examples of these thoughts could be that an older candidate may wrongly assume that a younger hiring manager might have reservations about them, for example: There is a misconception amongst hiring managers that older people are not up-to-date, are slower, lacking the energy and physical capacity to excel in senior management roles that their younger competitors won’t have. However, on the flip side: some studies suggest that older workers are favoured in their access to managerial roles. And, hiring managers’ attitudes to older workers are becoming increasingly positive. Both recruiters and hiring managers consistently identify a range of benefits of employing older people. Louise: It’s really positive to see evidence to support older workers are valued for their knowledge, skill and expertise. What advice can you offer on this subject that will be beneficial to senior executive job seekers? Daniel: You can manage these concerns through your CV, LinkedIn profile and interactions with the employer so that you can turn these thoughts on their head. Let me use the examples I made earlier to show you what I mean. Display enthusiasm as you discuss your passions and the role you hope to land. Draw attention to examples where you’ve shown adaptability, flexibility and creative thinking in your career, emphasising the results you achieved. Prove that you’re willing, able and tech-savvy by establishing yourself as a social leader. And finally, talk about your hobbies and pastimes, demonstrating varied interests and passions. Louise: Great, thank you for sharing those insights Daniel. I hope that this has been useful and valuable to senior executive job seekers.